Sunny. High 66F. Winds WNW at 5 to 10 mph..
ON THE VENEZUELA-COLOMBIA BORDER — She is 15 years old, pregnant, hungry and alone. Deisimar sat on a bench in a park in Maicao, just inside Colombia, and wept as she told her story — the story of Venezuela. Deisimar was born in an oil-rich, middle-class Venezuela. Then everything began to collapse at a pace reminiscent of Weimar Germany or Syria during the civil war. In the oil hub of Maracaibo, Deisimar’s family lost electricity, reliable running water, health care and, finally, food. Venezuela’s inflation may reach 10 million percent this year, the International Monetary Fund says, and some people root through garbage or eat rats to survive. “We had no money to buy food, so I came here,” Deisimar explained. Complicating the situation, she had become pregnant by her equally impoverished 18-year-old boyfriend. Contraception has become unavailable or unaffordable: A single condom now costs as much as a couple of pounds of rice and more than a tank of gas. “I don’t have enough to eat, so how could I pay for birth control?” Deisimar asked me. She walks about selling medicines from 6 a.m. to 8 p.m. each day. She eats at a soup kitchen when she can, but there are long lines because there are so many desperate Venezuelans here, with hundreds sleeping in the park each night. Deisimar hasn’t been to a clinic for any prenatal care, and she doesn’t know what will happen to her. “Nobody in my family knows I’m pregnant,” she said. After traveling along the border with Mercy Corps, an aid group helping Venezuelans in this border region, I ache with stories from so many people like Deisimar. More than 3.4 million Venezuelans have fled their country so far, according to the United Nations, and millions more are expected to follow this year. American liberals sometimes sympathize with the Venezuelan president, Nicolás Maduro, out of instinctive resistance to President Donald Trump. Don’t. Maduro has been a catastrophe for Venezuelans, and Trump is right to join Canada and more than 50 other countries in recognizing the head of the National Assembly, Juan Guaidó, as the legitimate leader of Venezuela. The problem is that Trump’s saber-rattling backfires, helping Maduro by playing into a narrative of Yankee imperialism, and his politicization of humanitarian aid makes it less likely that starving people will actually be fed. Here’s a three-part strategy that some other countries are already moving toward: Nudge Mexico (which has refused to back Guaidó) to play a more constructive role; work with Canada, Peru and Colombia to coax and coerce Venezuela’s generals away from Maduro; and offer Maduro a comfortable retirement abroad if he steps down, versus a prison cell if he remains. Conditions may get worse, for the economy and health system are virtually in free fall. A university survey found that two-thirds of Venezuelans had lost weight — an average of 25 pounds in a single year. “Sometimes we went two or three days without eating anything,” a mother, Anyi Coromoto, 25, told me, a day after arriving from Maracaibo with her son, Dylan. Coromoto is sticklike and weighs just 93 pounds. Dylan, 1 year old, weighs 11 pounds and was immediately hospitalized to save his life. In a world that has mostly treated migrants wretchedly, Colombia is playing a heroic role in providing such care. The country has admitted perhaps 2 million Venezuelans — often allowing them to work, attend school and receive free health care. And ordinary Colombians routinely give food to hungry Venezuelans on the street; the world has much to learn from warmhearted Colombians. Still, the bureaucracy often doesn’t work at the grassroots, and I found many Venezuelan children whom local schools refused to admit because they were already too crowded. In the city of Riohacha, I met a large extended family living in a parking lot, and the kids have not been able to attend school. One girl’s great-grandmother had been illiterate; the grandmother had gone to primary school and learned to read; and the mother had been to ninth grade. But because of the crisis in Venezuela and the difficulty attending school in Colombia, the girl, 12-year-old Yanethzy Sánchez, has not been to school for three years and can’t read even simple words. Her 18-year-old sister died last year from pneumonia, and Yanethzy, once outgoing, is fearful and withdrawn. “She never leaves the parking lot,” her mom fretted. It seems that she may never get an education, like others in Venezuela’s lost generation. I asked Yanethzy if she could write her name. She couldn’t. I asked her what three times four was; she looked blank. I tried another: What is four plus six? Nicholas Kristof, a columnist for The New York Times, grew up on a sheep farm near Yamhill. 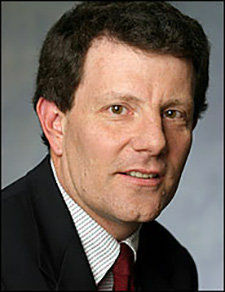 Nicholas Kristof, who grew up on a sheep farm in Yamhill County, is a columnist for the New York Times.